APAS/Wizard Strobe ï¿½ lets you turn any digital video into a still strobe image. 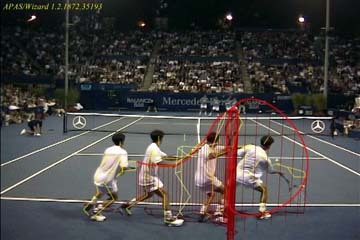 If kinematic data is available it can be overlayed on top of the strobe. Although commonly-used to describe an electronic flash unit, especially one used in a studio, a strobe (short for "stroboscope" or "stroboscopic lamp") actually refers to an intermittently-flashing, extremely-short duration, bright light source. APAS/Wizard Strobe ï¿½ simulates this in software by creating a still image from multiple images or from video. Capture video To capture video to a hard drive. This can include firewire capture from DV cameras. Select video Select an existing video file (*.avi; *.mpg; *.wmv). Identify events Events can be determined automatically or manually. Events uniquely identify the frames of the video. Create strobe Create still image based on video and events (or images). Post processing Overlay graphics on image by manually drawing them or by selecting them from kinematic data (if available). Generated on 4/25/2019 11:41:11 AM (PST) ADI/HQ/GBA/2019/ARIELCLOUD/v3.0.2018.0126.